Cast ion is a mixture of pure iron and approximately 3% carbon. Castings are made by pouring the molten iron into a mould. It is NOT used by blacksmiths, who beat metal to shape by forging it with hammers on an anvil, but was fashionably used in Victorian times to make mass produced gates and railings. 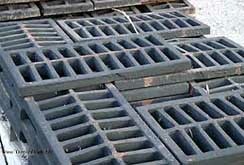 However, since it is rather weak compared to steel or wrought iron, it cannot be cast too thin. Work made from it tends to lack finesse, having a rather heavy and inelegant look to it.